“Eye in the Sky,” is not your typical war movie. Director Gavin Hood has created a military thriller without firefights, bombs, ear-shattering explosions or mud-and-blood spattered soldiers. Unlike most war movies, this one is not about boots-on-the-ground battles. The battle in “Eye in the Sky” is waged behind-the-scenes, at military bases thousands of miles away, in electronic control rooms, and in high-level government offices. That’s where strategists, soldiers, lawyers and politicians engage in high-stakes decision-making that must balance military goals with morality and political considerations–all in the context of 21st Century, remote-control drone warfare. The plot revolves around a British-led, targeted drone strike against a group of El Shabbab terrorists in Nairobi, Kenya. Military higher-ups have authorized the strike on a house in Kenya, where three of the most-wanted terrorists have been spotted and confirmed by drone cameras [including a nifty little, beetle-sized flying drone and sophisticated face-recognition software.] But as the drone operator puts his finger on the trigger, a 9-year-old girl enters the kill zone and sets up shop selling bread. Her presence sets off the moral/political/military dilemma that drives the movie. Other movie makers might have added a dramatic, pulsating musical score to tell you that you’re supposed to be on the edge of your seat. Others might have tossed in extraneous characters, red herrings, comic relief, expensive special effects, or sentimental backstories for the main characters. Hood does none of this. The story itself is enough, and he tells it–to excellent effect–step by step and without embellishment. [No spoilers.] Insightful writing, restrained directing and excellent casting [Hellen Mirren and the late, lamented Alan Rickman, to name the top two] make “Eye in the Sky” a worthy, thought-provoking movie experience. I have no idea if this film is based on a real incident. But if it’s not, it should be. I want to believe that the kind of forethought and ethical wrestling depicted in “Eye in the Sky” plays out in drone warfare. But I’m not that naive. Sure, it would be reassuring to know that people up and down the decision-making hierarchy take morality into consideration as part of their duties. It was refreshing, for example, to watch the drone operators refuse to take action until they were reassured that what they were about to do was morally and legally justified. But we also see that each of the players– including the British Foreign Secretary, the British Attorney General, the US Secretary of State, the British Prime Minister, and the head of the prevailing party in Parliament–has a specific mission to fulfill. Each sees the situation through his or her own prism. And through them, we realize how complicated these kinds of decisions can be. And, by the way, no one wants to make the ultimate call. 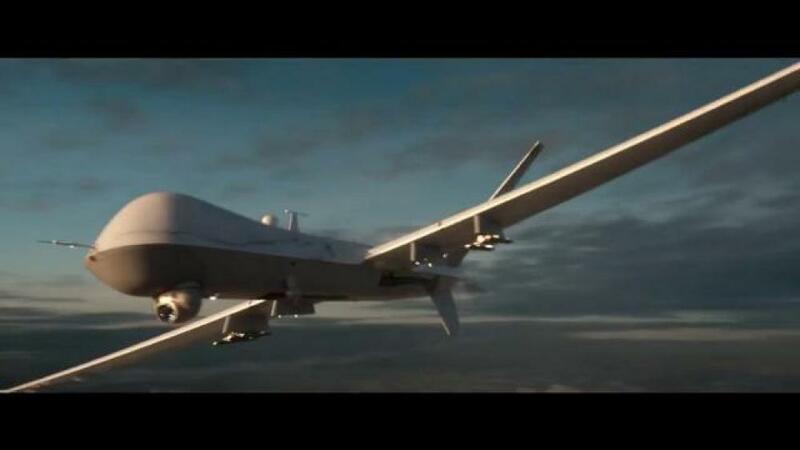 “Eye in the Sky” raises many thorny questions: Which would be worse, saving one child by calling off a drone strike on terrorists who are arming up in suicide vests, or authorizing the strike, knowing that there’s a high probability of the child dying as “collateral damage?” Should a drone operator have to follow orders that he thinks are immoral? Can the military legally kill a citizen of its own country who has joined up with terrorists in another nation? Does remote-control warfare make it too easy for generals and pilots to walk away from the destruction they inflict? Are these new issues, or the same ones faced over centuries of conventional war? None of these questions is easily answered, and to its credit, “Eye in the Sky” doesn’t try to.